Eat Wagashi traditional confectionary Japanese sweets to diet without giving up on eating the sweet your love. Low-calorie low-fat Japanese sweets. Wagashi Japanese traditional confectionary sweets hold their own when compared to delectable we know and love so much such as donuts and cake. Japanese sweats known as Wagashi in Japan not only come with low calories, but hardy contain fat that may be your secret to eating sweets without getting fat. Does eating too much Japanese sweets make you fat? It's not easy to quit once you start. The temptation of sweets hitting your nose is almost as intoxicating as the feeling you get after you put sweets in your mouth everywhere you go, the stores are lined up and calling your name. I know what that that last guy said, "Hey you want some cake?" That was awkward... Then then suddenly a light shined bright "What about me, Wagashi?" Compared to cake packed with cream and butter, Japanese Wagashi-sweets made with red beans and potatoes can satisfy your needs without ruining your diet. In today's Slism we are going to show you just how low in calories Japanese sweets can be along other incentives so that you can continue dieting without giving up sweets. 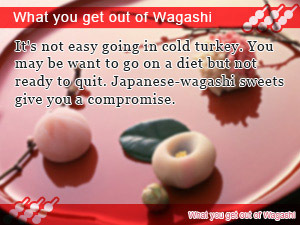 Wagashi leaves a lasting impression that in spite of modest calorie sweetness all are below 200 calories. Compared to commercially available short cake, donuts, and cream puffs with calories range from 200 to 400 calories per unit serving size traditional Japanese-wagashi sweets seem like a good alternative to ease your craving for sweet things. Let's take a quick look at how the well-known Wagashi sweet Daifuku holds up against that standstill traditional donut. 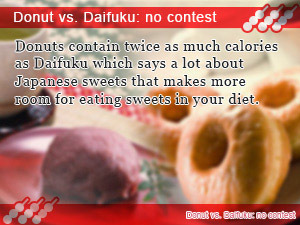 The following is a table comparing donuts and Wagashi-Daifuku in terms of calories and fat content. What you notice at first is not only are the number of calories per serving substantially difference, fat content is on a whole other scale. Your average donut contains around 1 gram of fat for every 5 grams of donut. On the other hand, the fat content in Japanese Daifuku is short from being negligible. The difference comes with how the two sweets are made. Donuts are made using butter, dairy products (milk) and eggs that include relatively large amounts of fat to start out with. Conversely, Daifuku is made only using two ingredients: red bean paste (Anko) and glutinous rice (Mochi) that don't contain very much fat at all. 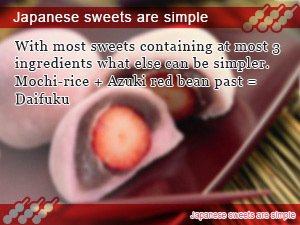 Red Azuki bean paste used in making Daifukumochi is a good source of dietary fiber. There is said to be as much as 1.3 grams of dietary fiber in one Daifuku. It's important to note that the fact remains for all Wagashi-sweets using Azuki red bean paste and potatoes. A lot of dieters would beg to differ in saying that Japanese-wagashi sweets don't contain fat, but contain sugar. That just goes to say that eating too much Japanese sweets can make you fat in the same way cake does. As you know sugar does not cause fat unless you overdose. That is to say that if you can find a way to moderate your sugar intake there is no reason to worry about getting fat from eating to much desert. In experiments with animals have shown that you do not become obese if appropriate energy intake, even if a lot of sugar intake. Further, in experiments with animals in the same way, it has been found that even if appropriate, in the case of a large fat intake leads to obesity calories. Japanese-Wagashi sweets don't contain a lot of fat but contain sugar. Western-Yogashi sweets contain large amount of fat that includes sugar. However, in order to prevent the intake of sugar and fat, there is also a point that must be noted. It will become a cause of obesity amount to be ingested per day is the same, but when you ingest sugar much at once, such as raising the blood glucose level, we must not allow the intake of a lot at once. As Long As You Keep Your Calorie Intake Down Eating Sweets Is Okay! As explained above, Japanese sweets don't make you fat at long as you pay attention to your daily calorie intake. When you are on a diet but can't keep your eye and hands of Japanese sweets there is a simple rule to make everything better. Although there is a difference in number of calories depending on serving size and cooking method, a single Wagashi-sweet can be thought of as roughly 200 calories. Let's put it this way if you find yourself eating a sweet Daifuku every once in a while don't sweat it, just find a way to reduce the amount of calories you eat in that day by 200 and everything should be fine. If you can figure that out then go exercise while you think about it to escape the guild of cheating your diet. If you are one of those people who can't quite quit eating sweats then think patience. As long as you are patient you can avoid stress buildup potentially dangerous to your diet causing gross overeating and frustration. Patience is the key to succeeding in your diet while still being able to treat yourself to sweets. The red bean bun diet gives you the tools you need to stop comfort eating fast by eating Japanese Anpan letting you relax a little resting from strict eating restrictions. It's not easy going in cold turkey. You may be want to go on a diet but not ready to quit. Japanese-wagashi sweets give you a compromise. Donuts contain twice as much calories as Daifuku which says a lot about Japanese sweets that makes more room for eating sweets in your diet.